Get Paid When You Search! Receive a Sign Up Bonus of 25 PRE! Sign Up Now! Buy Tokens! 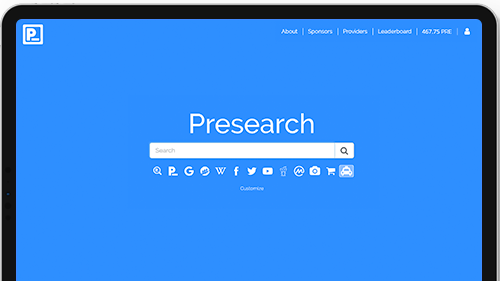 Presearch puts the power, control and rewards back into the hands of the community that is building and using the platform, aligning all of our interests. Google, Facebook and Amazon are already big enough! It’s time to send these corporate giants a message. By using Presearch, you’re making your voice heard. With Presearch, you can easily support projects that are creating decentralized alternatives. Discover and try other platforms that align with your values. We do not track or store any of your information or searches. Unlike some online giants, with Presearch, you control your data, choosing if and when to share it. When you search, you will be rewarded with Presearch’s PRE crypto tokens. These tokens can be used to buy services, or traded for other cryptocurrencies. Want to really support the project and get access to our next generation advertising platform? Buy PRE tokens on the Presearch Token Marketplace.